During my senior year of high school, I bailed out early. I think at the time I remember feeling completely over high school (big surprise) and one day while at the college guidance counselor, I pulled out an informational sheet on something called the ‘Illinois Government Internship Program’ aka, IGIP (a now defunct internship program thanks to the state government cutting funding in 2010). This was a program that was offered to seniors in high school that could take a semester away, live in the bustling state capital of Springfield (sarcasm), and internship at one of the various government agencies. And so, I packed my bags at the end of the December and away I went to begin what I thought was going to be a career in politics (this is only slightly funny as there’s still a thought in the back of my head about someday running for public office- maybe when I’m 40). At any rate, it was a rather interesting experience. I didn’t really fit in with the group of kids selected, I ended up working for the Sangamom County Democrats (I was gunning for an internship in the economic department of the governors office, but alas, they decided they didn’t need interns), and overall quite a bit of my time was spent cold calling/filing/eating. However, it was a somewhat exciting time as this rising state senator named Obama was about to run for US senate and we held a few fundraising events for him, so I got to meet him on various occasions. Of course, this post would be pretty boring if I dove into politics (and by boring, most likely insight a comment war), so we’re going to chat about one of the overall highlights to come out of the internship program: my love of the horseshoe. Now, if you’ve never been to Springfield, Il, you probably have no idea what a horseshoe is in terms of food. Well, it’s simple really: it starts with a slab of thick bread, then it’s topped with some form of meat (usually a burger), then piled high with fries and smothered with a special type of cheese sauce. 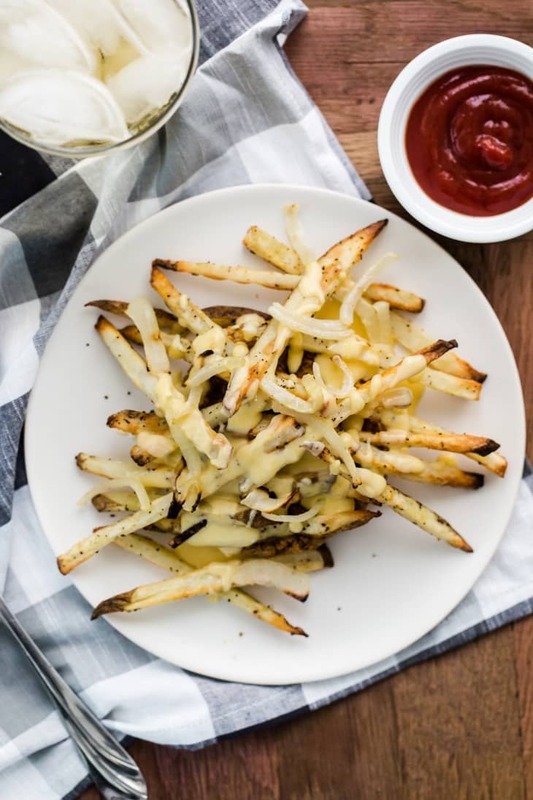 You can order them with grilled onions, chili, and a myriad of other toppings- but were going to keep it simple for today. This recipe is one of M and I’s favorites and at one point in time, it was on the blog (but got lost in a transition somewhere around 2009.) 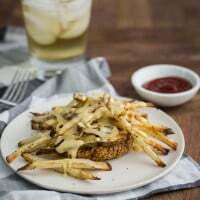 For the vegetarian purpose, I leave the thick slice of bread off (if it’s not soaking up actual burger juice, it’s really just extra filling), I use my favorite veggie burger, and I make a homemade cheese sauce (I have had my fair share of horseshoes with smothered with canned cheese sauce, yuck!) And why is my version called a ponyshoe? The horseshoe is two slices of bread + two servings of meat while the ponyshoe is a more respectable, one slab of bread and one serving of meat (I don’t think I could fathom eating two of these veggie burgers in one sitting). Prepare fries and veggies burgers as directions instruct. I’ll often make a batch of the veggies burgers (these ones) ahead of time and freeze them for use whenever I like. In a medium sauce pan, combine cheddar cheese and cornstarch in a small pot. Heat over medium low and stir until cheddar begins to melt. Add 6 tablespoons milk (or beer), Worcestershire, mustard and garlic powder, stir until mixture comes together. Add more milk (or beer), 1-2 tablespoon at a time, stirring frequently, to reach a pourable cheese sauce, 4 to 5 minutes. 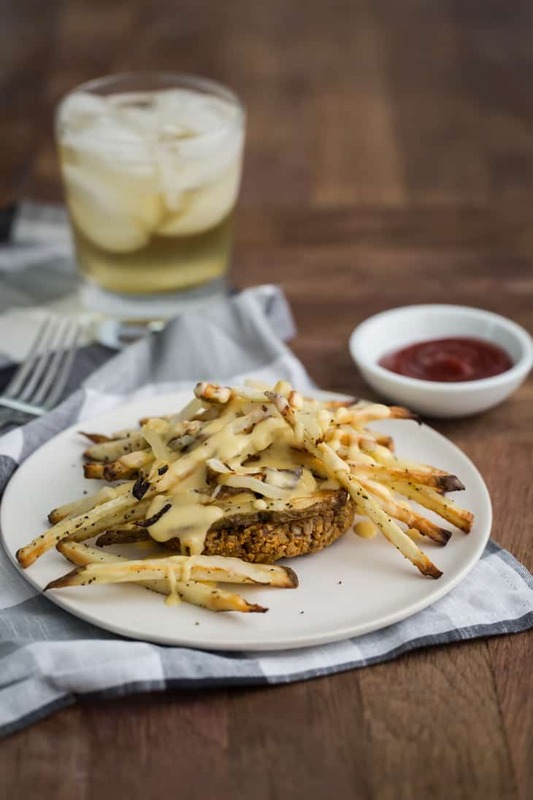 Assemble the ponyshoe by topping the burger with a heap of fries drizzle of cheese sauce, grilled onions (if desired), and serve with a side of ketchup. I recommend a touch of hot sauce in the cheese sauce, though. I think it really makes it something else. Ha! Love it! And yeah to the hot sauce- I’ve been steering away from any hot sauce with the major pregnancy heartburn I’ve been having, but that’s such a great addition! I grew up near Springfield, raised on pony shoes – always from D’Arcy’s Pint! I’m vegetarian now and excited to try this at home, thanks! YES! Love D’Arcy’s (and Norb Andy’s). So, so good. Holy smokes! I’ve never heard of this before and it has totally changed my liiiiiiiife! Definitely need to get on this recipe! This looks delicious! Being from Texas, I’ve never heard of this. But thank you for sharing! I can’t wait to try it! I’ve never heard of this but it sounds awesome and I love that you’ve made a meatless version. I so wanna try it now! Oh wow this looks so delicious. Wondering if it would be just as good with non-dairy cheese 🙂 will be trying to make this one soon! I’ve never had much desire to go to Springfield before but I think you’ve single-handedly convinced me with this! PS I so want to hear about your meetings with Obama at some point! I have never heard of this dish before, but I am sure I can get on board with your veggie version of it. I love learning about regional dishes like this one. Oh man, this looks mouthwatering. Those fries looks so good. Is there a recipe for them too? 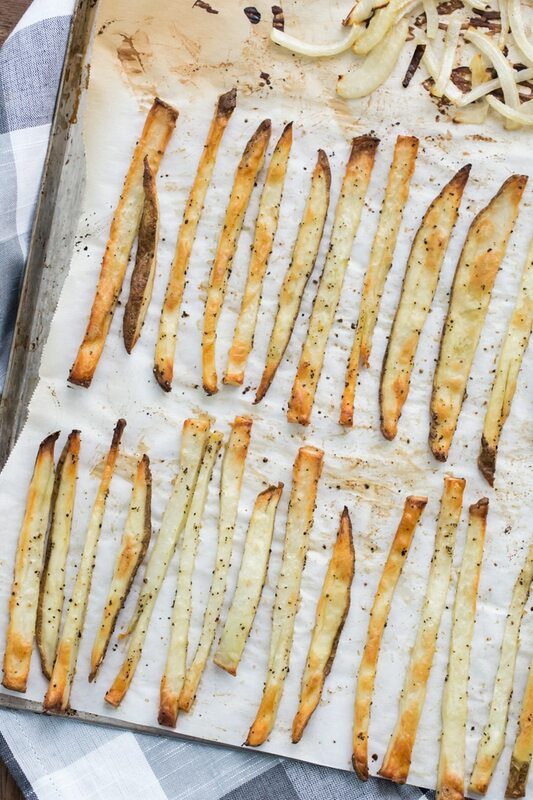 I do homemade potato wedges but I’ve never done fries and I’m wondering whether there’s any technique you advise. Yup! There’s a link in the recipe! As always, AMAZING. I really enjoy your Food Blog. Your having a baby…Yay! Congrats! This is going to be part of my Valentine’s Day meal. YUM! Looks/sounds/probably smells delicious! Yum. Yum. Yum. I love EVERYTHING about this. I can’t wait to try this cheese sauce!! We just finished *inhaling* this amazing meal. I have to make it again so we can savor it more. A great example of midwestern cuisine. The perfect combo of flavors. Thank you for the recipe. It’s up there with Runzas and Cincinnati Chili for slam dunks of midwestern foods. By the way, I used beer as the base. It was almost like a fondue sauce. Yum yum yum yum. I’ve never heard of horseshoe or ponyshoe, but it looks like something I need to make! You know, I don’t know! There’s not a lot of information on the dish. And fries on pizza does sound like a bit much!